Windows refugee here. On Windows you can easily copy the path and paste it elsewhere to get to the directory. Here is the situation on the Mac. I am in the Finder 20 folders down and I see the file I want. I go to my application and want to open it, so I pick Open Document from the File menu. However, it is exceedingly difficult and time-consuming to get to the place I want. 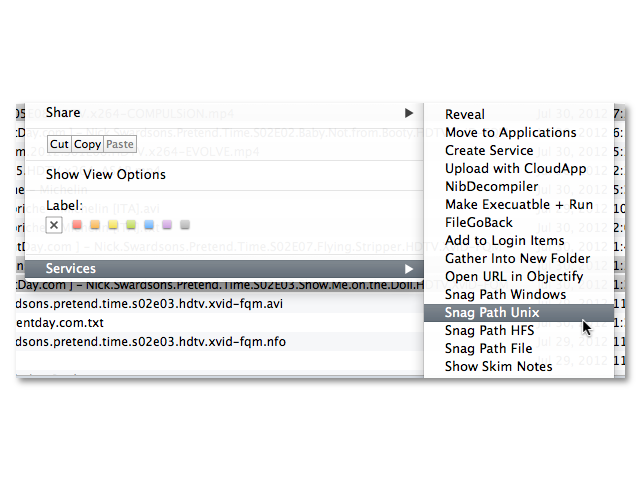 Is there a way to copy the path in the finder and paste it in the File Open dialog of my application? You can also right-click (hold Control and left-click, or better yet, open the Mouse pane of System Preferences and enable "Secondary Click" for your right mouse button) on the file in Finder, and click Open or Open With. I use Default Folder extensively, and if you have the Finder window open you can simply click it and it moves to that folder. You can also "Get Info" (Apple + I) and under "Where:" you will see the parent folder path, which you can copy and then append the folder name to it. In the finder, CMD+C usually just copies the "name" of the file.. It's also worth noting that the über-Finder-replacement, TotalFinder adds some nice options to the Finder's contextual menus in regards to Path Copying…. Edit for those of you unwilling or unlikely to use total finder, etc. there's another nice option called PathSnagger, which runs as a System service and is accessible under a contextual menu. Not the answer you're looking for? Browse other questions tagged macos mac finder or ask your own question. How to copy address of specific file / folder in Mac OS X? Program to Copy File Path with Mac OS X (that works with Open With)? Can I copy image's content rather than file path in Mac finder/path finder? Mac : How to enter the full directory path in a save As Dialog?